Port Isabel students collect data at three profile locations on South Padre Island: SPI01 in Isla Blanca Park, SPI02 at Beach Access #13 (Moonlight Circle, and the newest site, SPI08, at the Tiki Condominiums (E. Whitesands Street) (Fig. 1). Port Isabel High School has been measuring SPI01 and SPI02 since 1999, and SPI08 since 2007. Figure 1. Location map of Port Isabel High School monitoring sites. Brazos Santiago Pass, the southern border of South Padre Island, is dredged biannually. The pass serves as the southern Gulf of Mexico access to the Gulf Intracoastal Waterway and the Port of Brownsville. Sediment dredged from the pass is placed on beaches of South Padre Island (beneficial use of dredged material—BUDM) and the three sites monitored by Port Isabel High School students are within these nourishment areas. The SPI02 (Fig. 2) monitoring site has been used by students and scientists to monitor the growth of dunes (sand volume) and shoreline movement. When SPI02 was established in August 2000, there were no dunes between the retaining wall and waterline at this location. Since that time, student collected data has been quantifying the effects of the installation of sand fences, planting of vegetation, and numerous BUDM nourishment projects (Fig. 2). Port Isabel data have documented an overall trend to shoreline advancement and sediment-volume increase throughout the study period (Caudle and others, 2014). The vegetation line had remained in a relatively stable position prior to 2012. Since that time, a push-up dune was created by beach-maintenance practices (beach scraping to remove seaweed). The sand and seaweed scraped from the beach was placed just seaward of the vegetation line, and vegetation has begun to grow on the piled material (Fig. 2). Figure 2. Changes at SPI02 on South Padre Island due to beach-nourishment projects, the installation of sand fences, and beach maintenance practices. SPI08 is a chronically eroding location in front of the Tiki Condominiums near the north end of the city (Fig. 1). 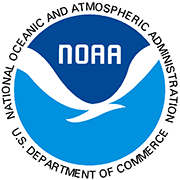 This site has a narrow beach backed by a retaining wall that periodically receives nourishment sand from road maintenance north of the City of South Padre Island and from dredging at Brazos Santiago Pass. The students from Port Isabel have been documenting the cycles between beach nourishment, dune creation by beach maintenance practices, and the long-term shoreline erosion trend. During the May 14, 2010, field trip, Port Isabel students and UT scientists observed that sand fencing had been installed and vegetation planted adjacent to the retaining wall. When the students returned to the site on September 28, 2010, the sand fence was gone and there was no trace of vegetation in front of the seawall. The narrow beach at this site appeared to be unable to support dune formation. 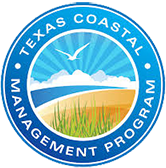 A large beach-nourishment project using BUDM from Brazos Santiago Pass was completed on South Padre Island in early 2011. The width of the beach and volume of sand significantly increased at the SPI08 location, although there were still no dunes or vegetation in front of the retaining wall (Fig. 3). On the May 13, 2011, field trip, Port Isabel students observed that a 0.5-m scarp had formed at the shoreline. The students continued to monitor this site during the 2011–2012 academic year to determine whether the nourished beach would reach equilibrium. The shoreline position had returned to the pre-nourishment position. After an initial significant decrease in beach volume (to pre-nourishment levels), volume on the back beach has increased steadily because of the re-installation of sand fences. In May 2013, the sand fences remained in place, serving to trap sand in front of the retaining wall at this site, and vegetation had been planted on the incipient dunes. On the final field trip of the 2013–2014 academic year, a large push-up dune was present seaward of the vegetation line. Throughout the 2014–2015 academic year, this location remained stable. The large spike in beach volume in late 2015 was due to a new push-up dune. Figure 3. 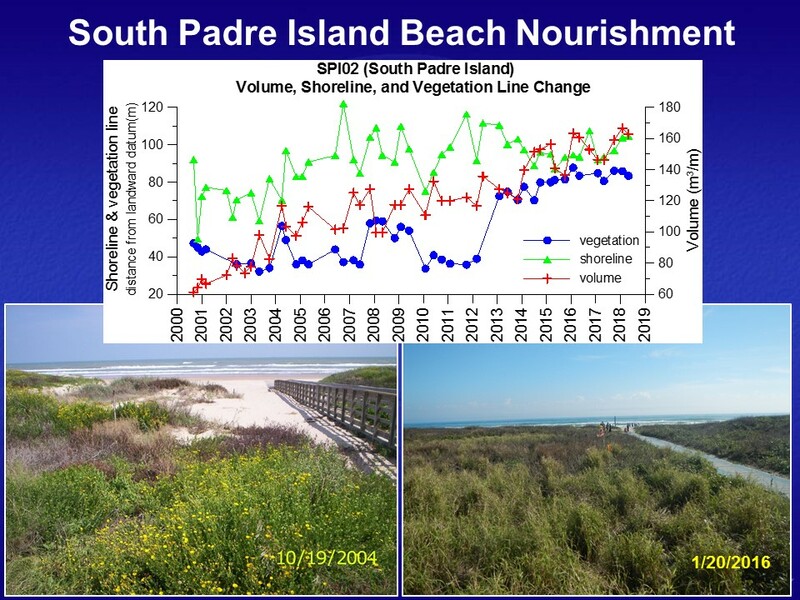 Volume and shoreline changes at SPI08 on South Padre Island due to beach-nourishment projects, the installation of sand fences, and beach maintenance practices. A beach nourishment project using beneficial use material from Brazos Santiago Pass, took place during the winter of 2015–2016. Profile data could not be collected on the January field trip because the area in front of the condominiums was blocked by dredging equipment. 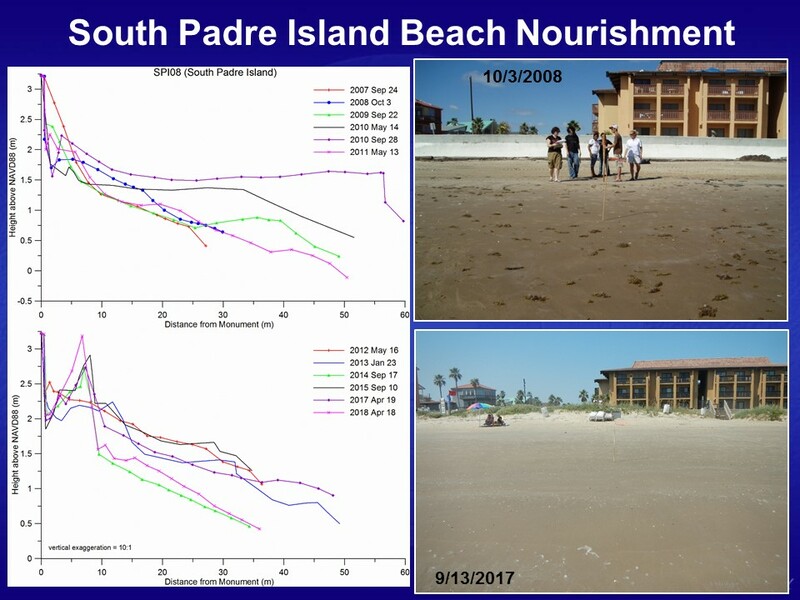 The spring 2016 data collection showed that shoreline position and beach volume were similar to the pre-nourishment conditions (Fig. 3). This profile site benefited from a small nourishment project located just to the south in later 2016. Throughout the 2016—2017 academic year, the shoreline position was stabilized in a more seaward location than it had been in previous years (Fig. 3). Increased beach volume was also stable due to a vegetated dune. Caudle, T.L. ; Tremblay, T.A. ; Paine, J.G. ; Andrews, J.A., and Saylam, K., 2014. 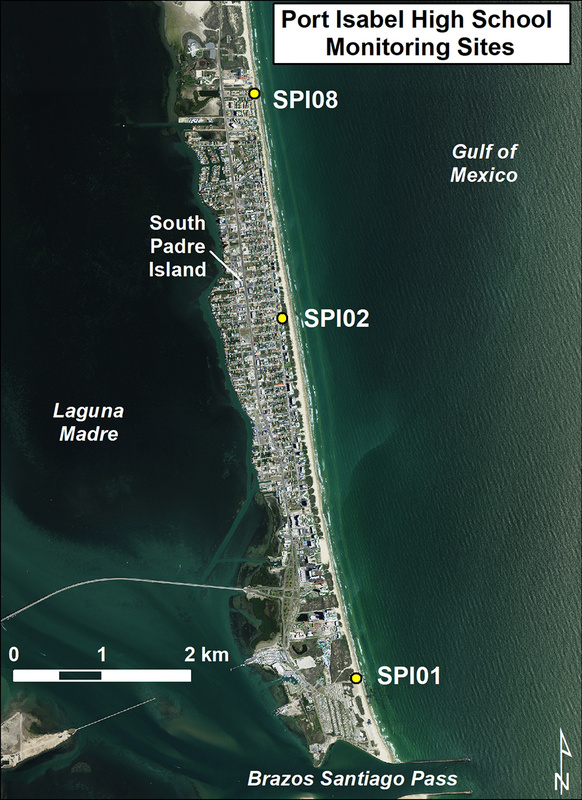 Beach and dune analysis using Chiroptera imaging system, South Padre and Brazos Islands, Texas Gulf coast. 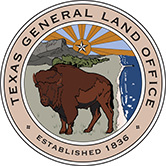 Final Report to the Texas Coastal Coordination Council and General Land Office, Contract No. 13-030-000-6895. The University of Texas at Austin: Bureau of Economic Geology, 68p.